Warplock is not an original game, its premise isn’t original, and its gameplay most assuredly is not original. Despite its unoriginality I can’t really find it in myself to dislike this game. I wrote my original review of this game immediately after buying this game for a second time. I originally overpaid for a copy at my local Pre-Played, only seeing on Ebay a few days later a boxed copy that was listed for the same price as what I paid for loose cart. I was understandably miffed and took it out on the game and not myself, I was extremely harsh on it and I rather regret it. So it seems about time I go back and re review Warplock. 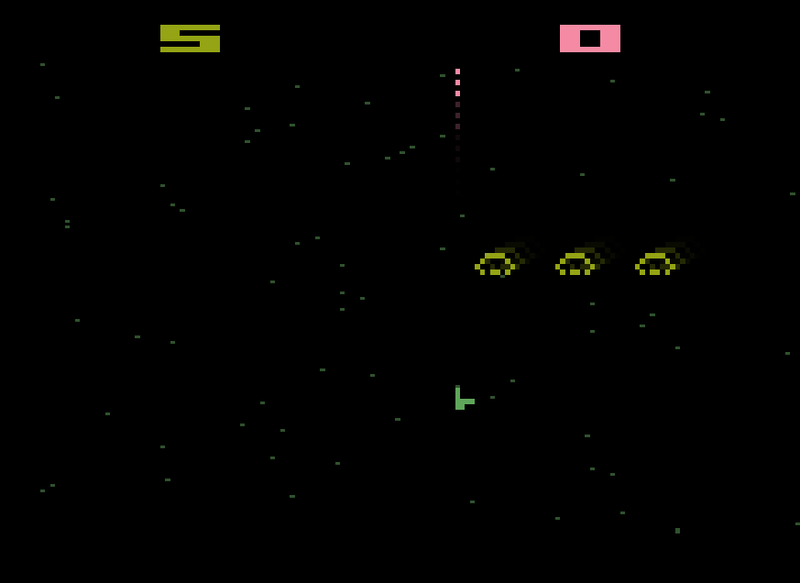 This game looks incredibly simple, all you have to look at is a decent starfield, your ship, and the enemy ships, as well as scored for one and two players. I’ll admit that the game looks like crap, seriously the ship designs are simplistic to the point of comedy, and the player ship is quite literally made up of eight pixels. The sounds are also appalling all you’ll be hearing is a guttural pulsating noise that will get on your nerves in no time flat. There is also a high pitched trilling noise that plays behind the pulsating noise that really doesn’t help things. To aid in the destruction of your eardrums all of the noises speed up as your score increases until it just becomes a solid lump of noise, it’s almost traumatic. The gameplay though is where the game remedies itself since it’s actually a pretty fun shooter. You control your ship with the Paddle controller, which will give you amazingly fluid control, which is nice in a fast paced shooter such as this. All you really do in this game is shoot at and avoid enemies, but don’t worry it ramps up the difficulty in due time. Enemies are as dumb as bricks, in fact they bear a striking resemblance to DVD screensavers, simply bouncing around the screen, once you pass certain point thresholds things begin to get hectic. First you start with a single enemy bouncing around, then you get two, when you score 16 points one of the enemies will remain at the top of the screen and start shooting at you while the other enemy continues to bounce around like a lunatic. I’m pretty sure you can get up to three enemies on the screen at once, and don’t forget that all the while these guys are getting faster and faster as your score increases. This game get’s real frantic and real hectic real fast, and as long as you turn the volume down I’m sure you’ll have a great time with this one. You can find copies of this game on Ebay for 6-10 dollars and boxed copies have historically sold for 20-25 dollars, I got lucky a while back and snagged by boxed copy for around 12 dollars so if your patient I’m sure a good price will show up. If you like simple addictive shooters on 2600 then there are few as fun as Warplock. What? You've never heard of a Plock before?